Five years ago, a T-Shirted Superman has Lex in a headlock and sports a spit lip. During the flashback we see Lex Luthor manage to salvage some of Superman's blood from a stain on his jacket. We jump forward three years and Lex, under contract from the military is creating Anti-Superman technology. The military however have their minds set on armored suits but with a sample of Superman's blood he can create a perfect, better, Superman that would answer his every whim. In the two years since obtaining the sample Lex has been trying to create a perfect splicing technique to make a superior Superman and a superior human cross. A young boy named Bobby is the recipient of the test serum and the youngster can barely contain his excitement. He is also clearly weak but Lex promises the splicing will make him better and stronger than he ever dreamed. Lex was the first person to ever give the boy an opportunity in life, the first person who cared about him... or so he believes. Bobby, dressed in a Superman T-Shirt sits in the specimen chair ready for treatment. Lex explains that nanobots in the serum will deliver an adenovirus that will ensure a merging of DNA. The tech speak goes over Bobby's head but he promises that he will do anything for Lex if he receives the treatment. Lex smiles and injects the 'A-0' serum into the boy. Bobby coughs up the nanobots and screams out in pain. Lex explains the nanobots have been ejected in the coughs now that they have finished the procedure. The villain then activates an artificial sun to deliver concentrated sunlight to force the new cells to work. The result is almost instant, far faster than the 24-48 hours Lex had expected. At first the results are stunning. Bobby sports a steroid like body but almost as fast the process begins to hurt. Bobby's skin starts to turn chalky and the strain of the excess muscle turns him ape-like. Lex is taken aback. The 'hypnotics' implanted in the 'A-O' serum doesn't allow Bobby to follow orders until he realizes that Bobby's flesh and organs were growing but the indestructible skeleton has caused blood flow to the expanding brain to be cut off, making Bobby an uncontrollable brute. Lex locks in the entire lab team with Bobby and takes steps backward to a weapons table as Bobby breaks out and keeps approaching. Using a K-Cannon to blast Bobby, the boy continues to astound Lex. Lex activates Lexbots and Quantum Hounds which were guarding the facility to attack Bobby. As Bobby grows he makes short work of the defenses and also develops powers, cryonic vision and incendiary breath. Still closer and closer, Bobby stumbles until Lex happens upon a theory and returns to the lab, reactivating the artificial sun to horrifying levels. Bobby begs Lex for help but the coldhearted scientist watches as Bobby grows out until he explodes in a mass of fleshy goop. The goop with its last drops of life still tries to approach Lex but is so weak it can only splat agains Lex's goggles. Lex scoops up a bit of Bobby's flesh into an agar dish. To Be Continued in FOREVER EVIL. Story - 4: A fascinating new twist on the Bizarro story that reminds us of Lex's streak of evil. Sholly Fisch is a fantastic writer that has offered a fresh new vision of the brutish clone. I really felt for poor Bobby, first for being tricked into the procedure and finally when he begs Lex to help him. I am looking forward to seeing Bobby return as Bizarro, I can only hope the Forever Evil story doesn't swamp this story in its 'big event' and that Bizarro, the tragic Superman, has more emotive stories like this one. Art - 4: I loved the art, it reminded me of Stuart Immonen's unique style. The refreshingly different style in the book really helped capture the frenetic style in story. I really liked seeing Bobby lash out and some of the Lex Luthor moments were simple, emotive and cold. Brilliant! Cover Art - 3: Sorry, I might be in the minority but the 3D cover doesn't appeal one bit. In fact the Arkham Origins ad was the best bit. 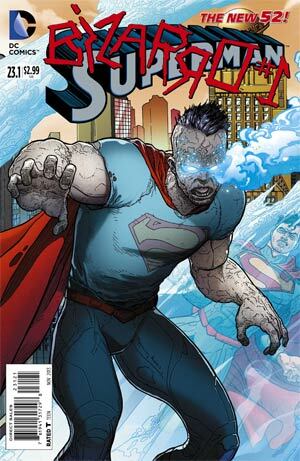 Bizarro here just looks like a zombie with a mohawk... I had to check I wasn't picking up a Marvel gimmick book. For the record despite the dislike of the '3D image' even as a 2D it still didn't really do the story inside any justice.